The Wright Wreport: Is this the YSL Belle D'Opium party? Really? Is this the YSL Belle D'Opium party? Really? Maggie Gyllenhaal, left, M.I.A. (with eye candy) and Katie Lee show up for Belle D'Opium. Photos by Cobrasnake. I'VE arrived! At nearly the 12th hour, I am invited to the YSL Belle D'Opium launch party. Where are we? Yes, in a space on the west end of 37th street christened the YSL Stage. I have left the night and entered into darkness and haze. Feeling uneasy, until I make out knots and clusters of people talking, drinking and looking at something. A juggler dressed in white. On a stage, doing his thing. Purplish lighting serves as a backdrop, lending him an ethereal quality. Is he there? Is he not there? Am I hallucinating already. Later, on the very stage I believe I witness a woman eating fire or doing a very good imitation of doing so. Some kind a den of iniquity – dark and dodgy. Does not appear to be elaborately decorated as legend says of the “Peking.” More pauper style. No, minimalist is the word. Music is pulsing. It's loud, but few seem to notice. Around a corner is a shooting gallery. Photogs or people with cameras are taking photos of the art, namely posters featuring Opium and BD'O while an audience of a few in this narrow room watch absently – their glasses of Champagne robotically moving from elbow to mouth. On a display case is a row of large BD’O bottles all askew. And empty. They arrived on empty, Luke gives me to know. Luke is standing at the tail of the gallery in front of red ropes hanging where a door normally would – very 70’s. Ropes are obscuring a very good view into a darkened room. From my vantage point I can only see portholes. Is there a yacht in there?! Luke politely informs me that no one is allowed in at the moment. By the way, Luke – straight outta Winnetka, Illinois – is now happily with Wilhelmina Models, and judging by the looks of him will shortly be appearing in an ad for Calvin Klein, Armani or Ralph Lauren or all three. In this den are nooks and crannies where chaise lounges and tables are ensconced for privacy and mystery. Colonies of chaise lounges are arranged in close proximity in open areas of the two-floor space, so EVERYBODY can see YOU. I’m sure the Peking had these, too. Cher probably sat on one. Cher is not here. Here is not Grace Jones. John Travolta, definitely not here. He's home sitting on a plush sofa giving Kelly a belly rub. Ali MacGraw! “That’s not Ali MacGraw,” some anonymous smartypants hisses, “that’s Katie Lee, she used to be married to Billy Joel.” Note to Self: “Self, Google Katie Lee.” Maggie Gyllenhaal is definitely here looking like a deb. Vixen in the animal-print micro-mini. Wassup M.I.A.? Ashley Olsen just bumped into me and didn't say, "my bad." Mary-Kate? Really, I defy anyone to tell those girls apart. This is not the 1977 party – at least not the one of legend and my imagination. From far it. Don’t think it is trying to be either. Just not sure what it is trying to be. Ding!, ding!, ding!, the light turns on! This party is a decoy. The actual party is jumping off from the airport hangar! In fact, I am chatting up a Maggie G. impersonator. Visit www.yslbeautyus.com for more information about Belle D'Opium. 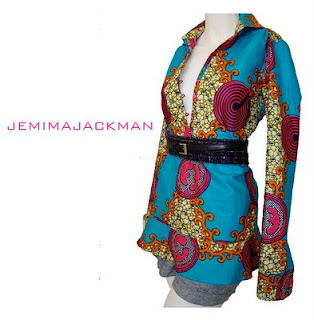 The Spring 2010 Jemima Jackman collection, including the multi-colored tunic with ruffle hem, was in part inspired by time the designer spent in Trinidad & Tobago. Below, Sandra Baquero's multi-dot dress with three elastic straps. Jemima Jackman puts a bit of chic in bohemian in her latest collection, while Sandra Baquero marches on with her mission to produce timeless pieces that are feminine and glamorous. Neither designer is a household name yet but the buzz is getting louder, especially for JJ who has been featured in both WWD and New York Magazine. New Yorkers who want to be able to say they owned a JJ or SB way back when should hustle over to the event space, Chacala NY, tomorrow for the Tribeca Retail Club’s “Summer Love.” Simply put, the love fest is a trunk show – product from more than a dozen designers, including the two superstars in-waiting. The TRC, which bills itself as an “underground fashionistas destination,” is making a party out of the whole thing. Admission is free, but $15 in advance/$20 at the door buys VIP treatment. VIPs can eat, drink and spend to the sounds of house deejay Lil Hungry. And, oh, there’s a swag bag. Learn more about the Tribeca Retail Club at http://www.trc2010.eventsbot.com/. The Victoire Focx collection includes wrist cuffs, chains and so forth, left, as well as boot cuffs, bottom. 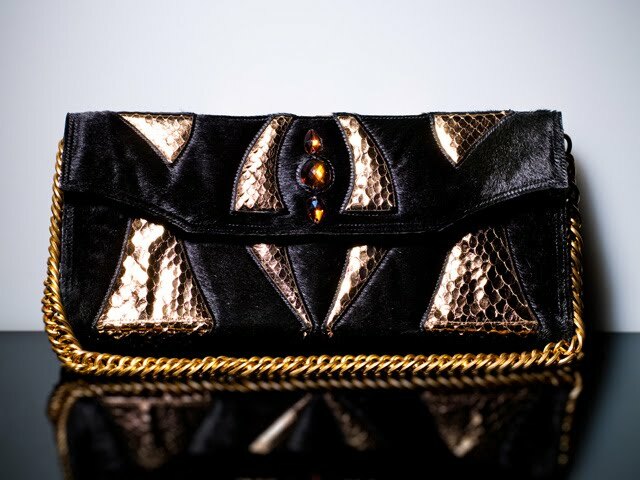 The Divadel clutch, below, has two strong features in Swarovski crystals and hand-painted cobra. Like all of the handbags, it is lined with signature Victoire purple suede. Photos from Victoire Focx. “Bag to the Basis: a Return to Luxury” is a collection of handbags and assorted little delights. Especially delightful is the result that CV achieves with her handbags when she mixes nappa leather with something like crocodile. Indeed, they are luxurious without looking overdone. Other pieces in the collection have about them a strong power of suggestion, for one would not think of owning a wrist cuff – until now. The collection will be available in August at EVA and BOND 07 at retail prices. The “junk” in the trunk will be 30 percent off. 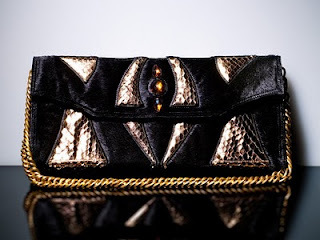 Learn more about Victoire Focx at http://www.victoirefocx.com/; EVA New York at http://www.evanewyork.net/store/; BOND 07 is soon coming to http://www.bond07.com/.